The global automotive industry is experiencing rapidly-changing dynamics as the increasing penetration of electronic content in vehicles has rendered the global automotive market highly competitive. The most common electronic features are Bluetooth connectivity, music streaming, and navigation system. The infotainment system provides scope to integrate a vehicle's audio, navigation, and climate systems with speakers. Thus, automotive audio speakers have evolved as one of the essential components in vehicles. Moreover, premium features that were limited to luxury vehicles are now being integrated into lower vehicle segments, which has heightened consumer expectations in lower-segment vehicles as well. Thus, the trend of adopting such advanced automotive infotainment systems is expected to drive the global automotive audio speakers market during the forecast period. As per Technavio, the emergence of IoT-enabled smart speakers will have a positive impact on the market and contribute to its growth significantly over the forecast period. This global automotive audio speakers marketresearch report also analyzes other important trends and market drivers that will affect market growth over 2019-2023. Currently, automotive entertainment systems are evolving significantly to include latest features and rapid processing pacer for delivering a personalized experience in vehicles. As automobile infotainment systems are differentiated in terms of their capabilities, manufacturers are collaborating with technology providers for integrating advanced features in more segments of their product portfolio. For instance, Amazon is in collaboration with several car manufacturers to integrate Alexa, its intuitive, artificial intelligence-based voice assistant, into mainstream automotive infotainment systems. Thus, the emergence of IoT-enabled smart speakers will not only provide advanced features but also drive the growth of the overall global market. "Along with the emergence of IoT-enabled smart speakers, the increased R&D to deliver superior products is another major aspect that is expected to drive the growth of the global market. During the forecast period, cutting-edge in-car entertainment is expected to feature in the next generation of electric vehicles, and this is seen enhancing the overall driving experience considerably. Hence, developments in next-generation audio systems are expected to drive the market focus during the forecast period," says a senior analyst at Technavio. 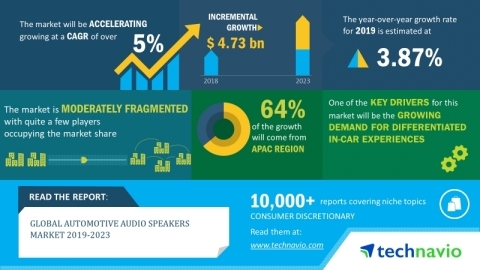 This market research report segments the global automotive audio speakers market by application (passenger cars and commercial vehicles) and geographical regions (APAC, Europe, North America, South America, and MEA). The APAC region led the market in 2018, followed by Europe, APAC, South America, and MEA, respectively. During the forecast period, the APAC region is expected to register the highest incremental growth due to the growing consumer fad towards in-vehicle entertainment and information systems in the region.